A salute to rank-and-file cavalrymen, She Wore A Yellow Ribbon lovingly portrays the machinations of cavalry tactics but forgets to include an engaging plot. It's 1876, and after Custer's defeat at Little Bighorn the small and remote Fort Starke cavalry post near the Arizona-Utah border is on high alert. Captain Nathan Brittles (John Wayne) is less than a week away from retirement, and his long time friend, the hard drinking and somewhat dim Sergeant Quincannon (Victor McLaglen) is also close to leaving the military. Brittles and Quincannon are assigned a final mission to scope out the movement of emboldened Indian tribes in the area. The mission is made much more complicated when the commanding officer Major Allshard (George O'Brien) also demands that his wife Abby (Mildred Natwick) and niece Olivia Dandridge (Joanne Dru) be escorted to a safer location. 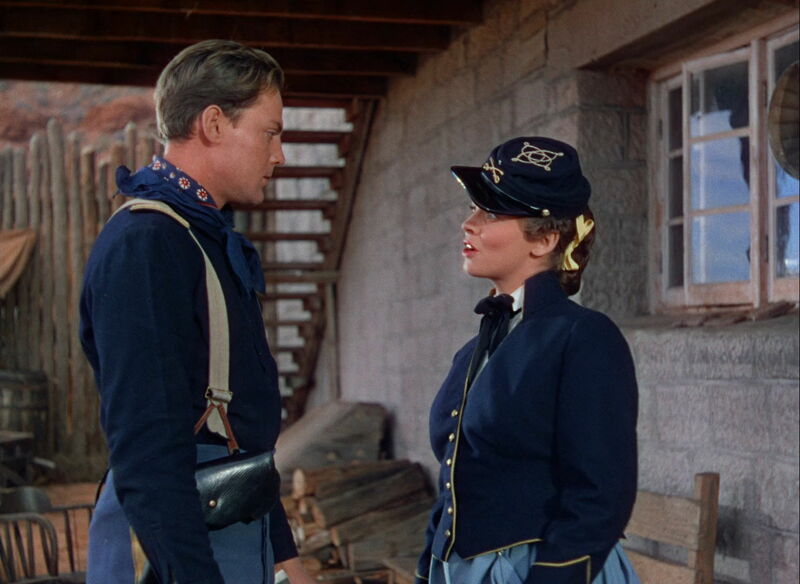 Brittles' men include Lieutenant Cohill (John Agar) and Lieutenant Pennell (Harry Carey Jr.), who are vying for Olivia's attention, as well as the more focused Sergeant Tyree (Ben Johnson). Navigating the tough terrain and avoiding confrontations with the marauding Indians will prove to be difficult. Directed by John Ford and featuring gorgeous Monument Valley backdrops, She Wore A Yellow Ribbon is stunning to look at but also tedious to watch. Despite a concise running length of just over 100 minutes, the film is primarily occupied with portraying the soldiers' life on the frontier. Once the tenor of barking orders, trumpet calls and horses marching in formation this way and then that way is established, precious little else engages the mind. Ford's predilection for dim humour drawn from men of Irish descent drinking their way to foolishness does not help. A couple of plot points are attempted on the long treks across the desert. In the first the soldiers need to navigate around invigorated Indian tribes, and the screenplay steers well clear of discussing any of the politics. 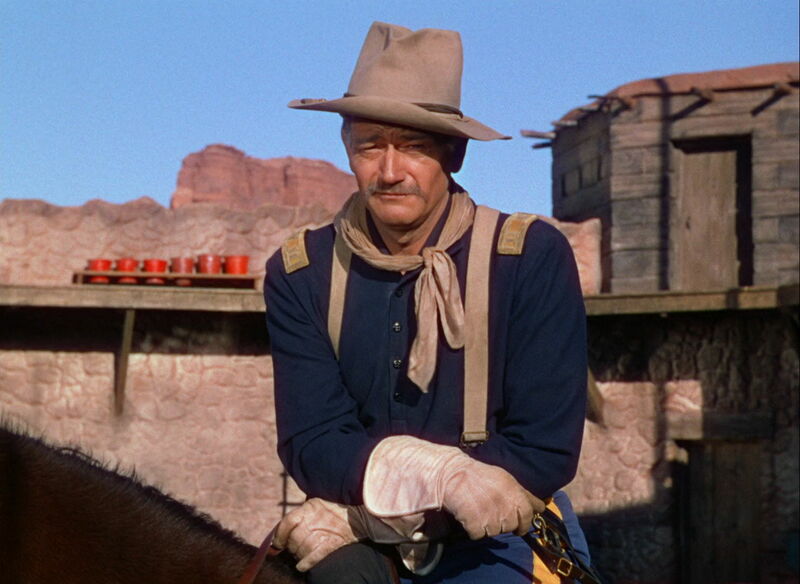 She Wore A Yellow Ribbon is old-fashioned in portraying the Indians as a violent threat to be either avoided or confronted head-on, no explanation necessary. The second and even weaker sub-plot involves a poorly defined romantic triangle featuring Olivia, Cohill, and Pennell. This is romance as imagined by a ten year old, with an impossibly beautiful woman whose presence on the frontier is barely explained causing young men to compete for her attention, and they proceed to behave with all the subtlety of young bucks locking horns. What remains amidst the impressive and colourful scenery is a notable John Wayne performance. The actor was 42 but playing an older man nearing retirement, and Wayne carries the burden of a lifetime invested on the dusty edge of civilization on his broad shoulders. Wayne as Brittles is just a bit more resigned and circumspect compared to his more common screen presence, and the sense of commitment to duty tinged with fatigue permeates the film. Beautiful but flawed, She Wore A Yellow Ribbon feasts the eye and starves the mind.